You cannot say that the melodic epic metal band Edenbridge from Austria isn't very busy. They have released three full-length albums in three years. Again the band around mastermind Lanvall and the exceptional singer Sabine Edelsbacher has done great work. Although my first impression of the CD was that the band is driving into a dead end street, repeated listening revealed that the album contains lots of interesting songs. The opener The Undiscovered Land is one of the highlights of the CD as it combines melancholic and progressive elements in an extraordinary way. But Edenbridge also go back to recipes which were successful in the past. Skyward and Fly At Higher Game are faster, melodic pop songs. There are also slower tracks like The Final Curtain or Where Silence Has Lease. A premiere for Edenbridge is the cooperation with a male guest singer, namely D.C. Cooper who sings with Sabine Edelsbacher on Red Ball In Blue Sky, a very dramatic song lasting nearly 10 minutes. 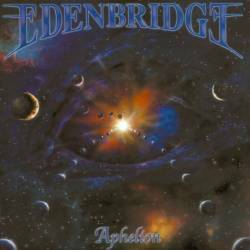 If you liked the two first Edenbridge CDs, Aphelion will also be up to your taste. Although it's no strict copy, it's close to the predecessors.